This is the fourth in a series of articles describing corneal opacifications. There are several etiologies for corneal opacifications that do not stain with fluorescein. These include corneal pigmentation, fibrosis, calcium or lipid deposition, cellular infiltration, the presence of a foreign body, sequestrum, and/or edema. This article will concentrate on corneal opacifications arising from fibrosis (scarification). The cornea is a unique and highly organized tissue that mediates transparency for vision. Within a healthy cornea the regular spatial arrangement of thin collagen fibers is transparent (weakly scatters light). A corneal injury can interrupt this arrangement increasing light scattering. The resultant corneal haze (corneal fibrosis or scarification) can impair vision. It can also be difficult for an examiner to visualize the internal components of an eye through a corneal haze. Etiologies for corneal fibrosis include corneal ulceration, infectious (fungal, bacterial, or viral) keratitis, decreased tear production and/or tear film stability, immune mediated diseases, and changes in neurotrophic factors that decrease corneal innervation. Corneal injuries confined to the epithelia do not typically result in fibrosis. However, injuries to the corneal stroma stimulate keratocyte activation and their transformation into healing myofibroblasts. Myofibroblasts will “restore” corneal stromal defects but their repair will not be transparent. Decreased transparency is a consequence of an opaque extracellular matrix that myofibroblasts secrete to fill stromal defects. Myofibroblasts within a healing wound are also less transparent than other corneal stromal cells since they lack soluble cystatins and contain insoluble actin fibers. 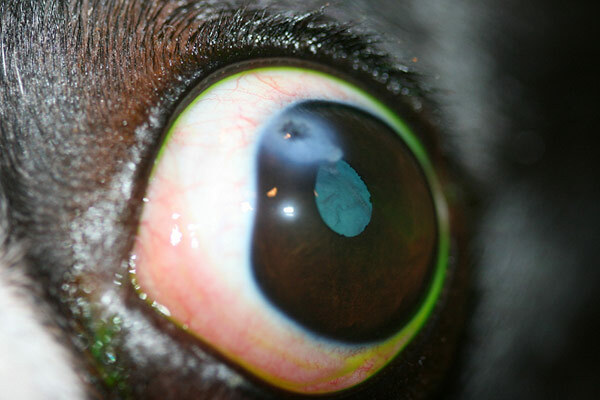 Myofibroblasts can be found within the haze of a healing corneal stromal defect for up to 6 months following an injury. The next phase of corneal stromal defect repair occurs between 4 months and 4 years after an injury. During this remodeling phase myofibroblasts regress and corneal tissue is restored to a preinjury state. The extracellular matrix is reorganized as collagen fibrils enlarge, organize, and crosslink. Subsequent corneal scars show increased tensile strength, increased transparency, decreased wound contracture, and appear to be more cosmetically pleasing. At the termination of the remodeling phase, a hypercellular scar will typically have 40% of the tensile strength of a normal uninjured cornea. The level of transparency of the resultant scar will depend upon a variety of factors including the size of the initial defect, the apposition of the joining tissue, the individual’s immune reponse, and other complications. A very faint corneal scar is often referred to as a nebula. A larger (intermediate) corneal scar is known as a macula, and the densest corneal scar is called a leukoma. Nebula scars can only be visualized via retroillumination using a slit lamp. A macula can typically be seen without magnification and under proper illumination will have a faint white appearance. A leukoma is readily visible and is completely opaque. If you have further questions concerning the differential diagnoses of corneal fibrosis, please feel free to consult with a veterinary ophthalmologist.